Heron Lodge01263 715779work01603 870304fax Self-cateringA beautiful holiday lodge set on Ormesby Broad, which is located at the southern end of The Broads National Park. Beautifully finished, the accommodation is open plan with a modern interior and makes a really great holiday home for family or friends. The lodge is set within 11 acres of parkland next to the Broad, fishing is available on site for most of the year and Heron Lodge is only moments away from the sandy beaches at Caistor-on-Sea and Great Yarmouth. Utilities: Electric oven, induction hob, fridge and microwave. Other: Towels, 2Wifi, Books and games- central borrowing library with exchange system. Childrens play area. Outdoors: Decked area with garden furniture and views toward the Broad. Access: Designated parking for one car, further parking in overspill car park. 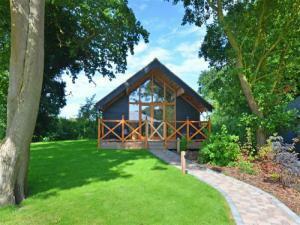 A beautiful holiday lodge set on Ormesby Broad, which is located at the southern end of The Broads National Park. Beautifully finished, the accommodation is open plan with a modern interior and makes a really great holiday home for family or friends. The lodge is set within 11 acres of parkland next to the Broad, fishing is available on site for most of the year and Heron Lodge is only moments away from the sandy beaches at Caistor-on-Sea and Great Yarmouth.